I often roast a chicken on a Sunday night and then use it throughout the week for lunches and evening meals. 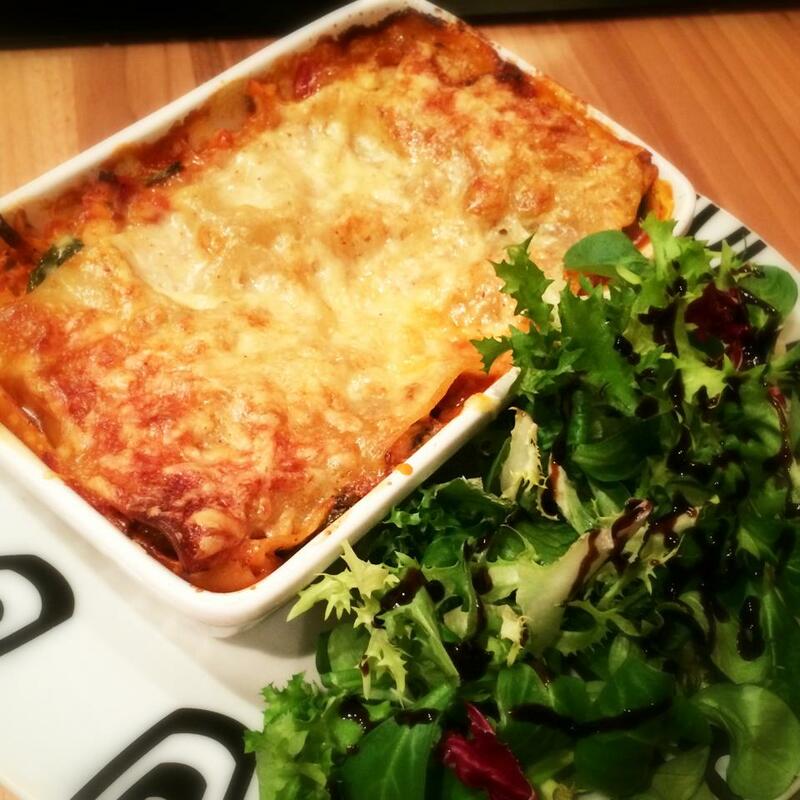 This week I decided to try something new and, being a lasagne lover, thought this combo would be really tasty. It is a bit higher in points than some of my other recipes but it really is worth it, filling and packed with flavour. If you don’t have left over roast chicken you could use finely chopped (or minced) chicken breast. Two 165g chicken breasts would be the same overall in points. I make this dish using individual lasagne dishes. You can get them in the pound shop and they are the perfect way to combine portion control with holding the whole lasagne nicely together. In this way you can also make this for only 2 people. If you want to use a large lasagne dish (which usually serves 4), you will need to double the recipe. If your chicken is already cooked skip this step, if not fry up your chicken until cooked through and then remove from pan. In the same pan add the onion, celery and pepper and cooked until the onions and celery are soft. Then add the chorizo, mushrooms, garlic, smoked paprika, crushed chillies, oregano and thyme, give a good stir and fry for another few minutes. Add a splash of balsamic vinegar and red wine and simmer until the red wine has reduced a little. Then add the chopped tomatoes, crumble in the stock cube and add a tin of water too (using the tomato tin). Add the chicken back to the pan. Simmer for 15-20 minutes until the flavours are all nicely combined. Now you can construct the lasagne. Take two individual lasagne dishes and pop a ¼ of the sauce in the bottom of each dish. Top with a lasagne sheet and then some white sauce. Grate on a little nutmeg. Add another layer of sauce and repeat with another pasta sheet, white sauce and nutmeg. Top with the grated cheese and a little more nutmeg. Make sure the cheese is well distributed so there is enough moisture to cook the top lasagne sheet. Pop in the oven for 30-40 minutes. Serve with a nice green salad and a little balsamic vinegar. Hi Laura, I’m loving your recipes and getting so much inspiration. There’s only two of us at home now so I like to cook for four and freeze half for another time. Do you think this Biriyani dish will freeze ok? Just browsing the website today and this recipe caught my eye, I suddenly realised I had all the required ingredients. 1 and a bit hours later I have a full belly and a very happy husband! Thanks so much! This was a fantastic recipe, very tasty! !